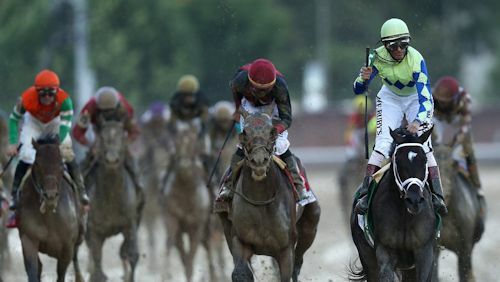 “What Rain?” That’s what over 158,000 fans said as the braved the weather at Churchill Downs for the 143rd running of the Kentucky Derby. And “What Rain?” is what Always Dreaming said (if horses could talk) as he ran away with the 2017 Kentucky Derby. The track in Louisville, Kentucky has now been lucky twice for trainer Todd Pletcher and jockey John Velasquez as they both got their second Derby wins here. Lookin At Lee, Battle of Midway and Classic Empire tried to make a final push but were held off by Always Dreaming as he was too strong down the stretch and won by two-and-three-quarter lengths. Always Dreaming opened at 5-1 odds just behind Classic Empire at 4-1. But by race time he was a 9-2 favorite. And guess what… for the 5th consecutive year the favorite won the Kentucky Derby. Remember that next year when placing your bets. Always Dreaming is on a roll. He has now won three consecutive races. Can he win two more and take home the Triple Crown?